The 2011 Mercedes-Benz C-Class C300 Luxury receives a minor exterior update, which includes a reshaped grille, larger air intakes, and contoured hood, as well as updated bumpers, headlights, and taillights. Other exterior features include crisp, aerodynamic lines, a chrome-slatted grille, halogen headlights and foglights, dual heated power mirrors, and dual chrome polished exhaust tips. Under the hood resides a 228-hp, 3.0-liter V6 engine, which puts out 221 lb-ft of torque, driving the C300 Luxury from 0 to 60 in 7.1 seconds. The V6 connects to a seven-speed automatic transmission with Touch Shift, which enables manual shifting. Inside, standard features include MB-Tex leatherette upholstery, eight-way power-adjustable front seats, a leather-wrapped multifunction steering wheel, and Burl Walnut trim. In addition, a central controller on the console makes it easy for drivers to operate many of the sedan's interior systems, including the dual-zone automatic climate control system, standard Bluetooth, and eight-speaker audio system with in-dash CD player and 5-inch color display, as well as an optional navigation system. Nine standard airbags include dual front, front seat-mounted side-impact, and full-length window-curtain airbags, and well as a driver's knee airbag. 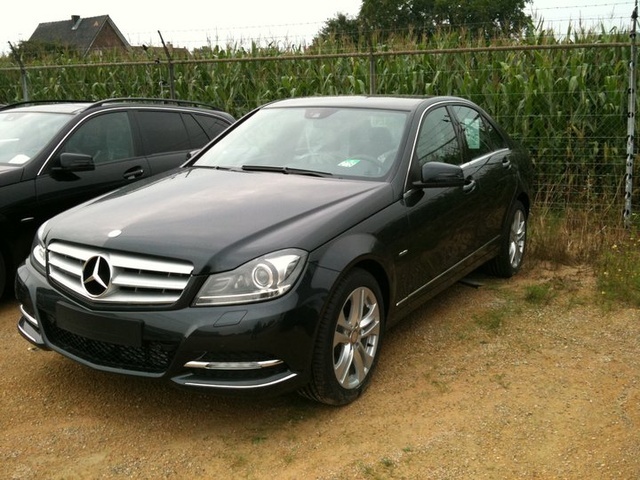 Other standard safety equipment for the 2011 C-Class C300 Luxury includes electronic stability control, traction control, and antilock brakes with brake assist. The rear-wheel-drive C300 Luxury rides on 17-inch alloy wheels with all-season performance tires. The Mercedes-Benz C-Class C300 Sport sedan gets a little sportier for 2011, thanks to a freshened exterior design, which features a more aggressive grille with mesh air intakes, restyled bumpers, a contoured hood, and new angled halogen headlights and taillights. Side skirts, a rear apron, programmable LED daytime running lights, polished chrome exhaust tips, and dual heated power mirrors add to the sedan's sporty good looks. A peppy 228-hp, 3.0-liter V6 engine, mated to a six-speed short-throw manual shifter, drives the C300 Sport from 0-60 mph in 7.1 seconds. The engine requires premium fuel and manages fuel economy numbers of 18/25 mpg. Such features as antilock brakes with brake assist, electronic stability control, and traction control, all standard, help keep passengers safe. The C300 Sport's staggered 17-inch wheels (8.5 inches wide in the rear vs. 7.5 inches in the front) also help improve stability and control when accelerating and negotiating turns, according to Mercedes. The C300 Sport's luxury-oriented cabin includes such standard features as a leather-wrapped multifunction steering wheel, eight-way power-adjustable sport front seats, a power tilt/slide tinted sunroof, and aluminum trim on the dash, doors, and center console. MB-Tex faux-leather upholstery also comes standard, although owners can upgrade to a leather upholstery package, which also adds ambient lighting. In addition, the standard features list includes dual-zone automatic climate control, electronic cruise control, Bluetooth, and an eight-speaker audio system with in-dash CD player and 5-inch color display. Nine airbags, including front, side, and a driver's-side knee airbag, protect passengers in emergency situations. Options include heated front seats, a Harman Kardon surround-sound audio system, and the automaker's COMAND communications system with navigation and Zagat guides. Thanks to a mid-generation refresh, the Mercedes-Benz C350 Sport sedan displays a sportier, more muscular exterior for 2011. The automaker reshaped the C350 Sport's bumpers and gave the front end a more aggressive look with a new grille, larger mesh air intakes, and a sport front air dam, plus new halogen headlights. Side skirts, a rear apron, and a rear spoiler add to the sedan's sporty good looks. LED daytime running lights, rain-sensing wipers, dual heated power mirrors, new LED taillights, and polished chrome exhaust tips are among the C350 Sport's other exterior features. For power, the C350 Sport comes equipped with a 268-hp, 2.5-liter DOHC V6, which delivers 258 lb-ft of torque and propels the sedan from 0-60 in 6.1 seconds. The V6 mates to the seven-speed automatic transmission with Touch Shift, which enables manual shifting. The interior retains its sporty yet luxury-oriented feel, with such features as a leather-trimmed steering wheel, Black Birdseye Maple wood trim, and heated front sport seats with 10-way power adjustment for the driver's side and 8-way power adjustment for the passenger side. Mercedes' MB-Tex leatherette upholstery comes standard, although owners can upgrade to a leather interior. Dual-zone automatic climate control, Bluetooth, a power tilt/slide sunroof, rubber-studded aluminum sport pedals, and an eight-speaker audio system with in-dash CD player and 5-inch color display are among the other standard features. Options include a Harman Kardon premium audio system, an in-dash 6-CD/DVD changer, and Mercedes' COMAND communications system with hard-drive navigation and Zagat guides. Nine airbags, including a driver's-side knee airbag, help keep passengers safe. Other standard safety features include traction control, stability control, and antilock brakes with brake assist. The C350 Sport rides on staggered 17-inch wheels (8.5 inches wide in the rear vs. 7.5 inches in the front), which helps improve stability and control when accelerating and negotiating turns, according to the automaker. The 2011 Mercedes-Benz C63 AMG sport sedan continues to rule the C-Class roost, thanks to its beefy 6.3-liter V8 engine, which puts out 451 hp and 443 lb-ft of torque. The V8 mates to an AMG SpeedShift Plus seven-speed automatic transmission with four-mode operation (Comfort, Sport, Sport Plus, and Manual settings), and drives the sport sedan from 0 to 60 in just 4.3 seconds. The big V8 requires premium fuel and manages fuel economy numbers of 12/19 mpg. Mercedes equips the C63 AMG with an AMG high-performance braking system and AMG-designed sports suspension, featuring AMG shock absorbers and stabilizers. The C63 AMG also comes equipped with an AMG sports exhaust system with dual chromed tailpipes. Electronic stability control, traction control, and antilock brakes with brake assist all come standard. The C63 AMG rides on 18-inch light-alloy AMG wheels with a high-sheen finish. The C63 AMG receives a mid-generation exterior refresh for 2011, which includes a more aggressive front end with a wide chrome-barred grille, reshaped bumpers, and dark-tinted front headlights and foglights. A reshaped hood with dual power domes, lateral air intakes, side skirts, a rear spoiler and apron, a rear diffuser, and LED taillights are among the other exterior features. Inside, standard features include Nappa leather upholstery, Black Birdseye Maple wood trim, and heated front sport seats with side bolsters and power adjustment. The AMG-designed instrument cluster features AMG lettering and a night-time design. Other standard features include dual-zone climate control and an eight-speaker AM/FM audio system with a CD player and 5-inch color display. Options include a navigation system with Zagat guides and a Harman Kardon surround-sound audio system.